Known For: I kept the sport alive all through my teaching career, introducing crokinole to new staff. I began the tradition of The JC Crokinole Classic which was a doubles tournament held each November. I also started The Canadian Crokinole Championships. Style of Play: My style of play depends on many factors: whose hammer, opponent, how many 20’s, left or right handed opponent. I tend to play a defensive game. Favourite Shot: The in off, although the perfect defensive shot is a close second. The only other shots that come to mind are the Nasal Draw shot, perfected by Elvis Husic and the Twiddle Shot used to hit that lonely opponent piece on the other side of the board. Favourite Board: As I collect antique boards, my favourite has to be my 1915 Eaton’s steel rimmed board or the Carrom board from India. Neither of these boards are used however, but my favourite playing board is my square home-made board crafted by my nephew Mark. Jon began playing crokinole in the early 60’s around his grandparent’s dining room table. It was a weekly family ritual after Sunday supper. Jon has never looked back. His grandfather was quite a player and taught Jon the old New Hamberg strategies of defensive play. Due to this, Jon nominates his Grandfather as his crokinole idol. For a long period of time, Jon preferred the doubles game as the strategies were much more involved with the rules he played by. Combination shots were not allowed and open shots could be placed anywhere. Over the years, singles play has become more enjoyable for Jon. This is most likely due to the different rules and his constant search for new strategies and techniques. 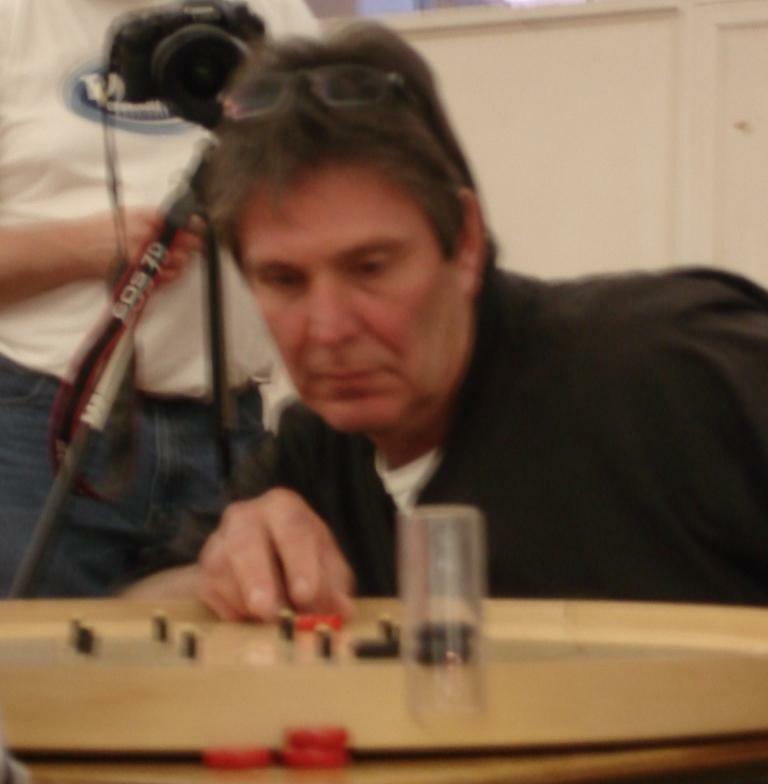 Jon is regarded as one of the most strategic crokinole players in the world and if you play him once, you will know why. His strategic style of play has led him to many of the achievements listed below and the list is getting longer each and every year. First Doubles Champion with partner Mark Seupersaud (aka. the team of Basic Instinct) in the Canadian Crokinole Championship. Member of the Cameron Heights team that won several team Joseph Schnieder Haus Championships .